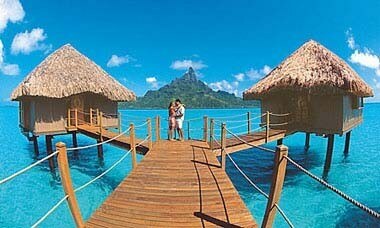 Our most popular overwater bungalow honeymoon package, featuring Le Meridien Bora Bora. Depart for Tahiti–the ultimate honeymoon destination. Arrive this evening where a South Pacific greeting of fragrant flower leis and traditional songs welcomes you. Spend your first romantic night at Tahiti Le Meridien Hotel. 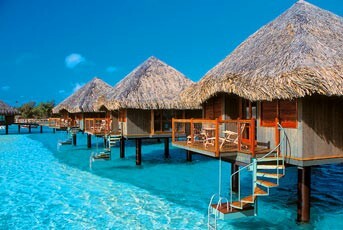 Enjoy a leisurely breakfast at your hotel in Tahiti before your mid-morning flight to beautiful Bora Bora. Check into your amazing overwater bungalow at Le Meridien Bora Bora and get ready for five fabulous days of unforgettable experiences. Swim with the playful stingrays and reef sharks, and watch them being hand fed. Enjoy daily breakfast buffet and scrumptious dinners at the hotel’s unique restarants. One evenuing, enjoy a romantic sunset catamaran cruise. Discover paradise at its finest! Late this afternoon return to Tahiti. Your romantic getaway comes to a pleasant end, as you board your Air Tahiti Nui flight to return home. * Prices are in USD, ‘from’ per person, based on double occupancy, unless specifically noted. Single or extra person (triple) supplements apply. Package rates are inclusive of room tax & VAT, International air-inclusive packages rates also reflect airline fuel surcharge and U.S. airline taxes and fees. Strictly subject to availability at time of booking. Black out dates, minimum stay requirements, seasonal surcharges, currency exchange fluctuations, and other restrictions may apply. Prices, itinerary and conditions are subject to change without notice. Clients may be responsible for local city taxes, bed taxes and airport departure taxes not included with the international ticket. Information will be provided at the time of booking. Pricing based on low season. Air fares are subject to change without prior notice. Prior to sending final payment, please request an air fare update. Upgrade to Air Tahiti Nui Business Class, from $2680 per person.